I have found the most perfect black skinny jean and it lives on the second floor of Macy's Herald Square in the Ben Sherman department. Technically these are grey, but I call them black. Ben Sherman also calls them "Siouxsie." 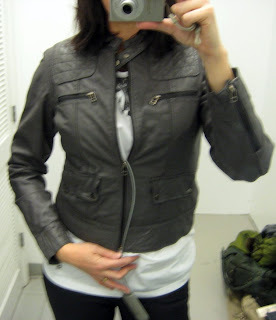 This Ben Sherman grey leather jacket is also quite perfect. I read the company is getting back to its roots (mod, rudeboy) this season. I like to call it preppy punk at its best. Take a quiet moment: long, super tight as if you'd pegged them, zippers on calves that look really cool from the side, MATTE black/grey that is slightly shiny or something but nothing obvious so these must never be able to shrink because of their car finish coating. But alas, for me it is not meant to be. Why? I'm not exactly toting around the most perfect body right now so there was a bit of a fit issue in the dressing room. We tugged at each other, we jumped up and down together, I begged and pleaded, I vowed to say a rosary or any other such unlikely religious thing if they would just go over my hips. I even laid down on the ground and broke a hanger trying the Olivia Newton John (sorry, Macy's), but no go. These jeans don't move. So no, they are not drop crotch, that's just unzipped agony. But do not pity me. From the girl who once owned the skinniest pair of black Lip Service jeans in Baltimore: I'll be back! I would never have known if you hadn't pointed it out! Well, they'll be there once you're feeling less wintrish, and they'll look KILLER. They already do actually, dropcrotch and all. Siouxsie And The Banshees! Whos young now? Do they run true to size?? p.s. Your whole body is perfect, just shut up! they seem to run small to me, as in a size, but I'm a bad judge now. let's just say I was sure I'd fit these as I would normally be max a 30, and these were 31! Amazing, those are so great. I became enthralled as soon as I read "Siouxsie." Hi there-hope you find the perfect pair, they look gorgeous on! the jacket is great too! Oh and btw, I have found pineapple enzymes gentler on my skin than other forms of exfoliants. Thanks, Grayburn! For anyone who's interested in exfoliating advice, visit Grayburn.blogspot.com. Loves me some zipper ankle jeans, doll! You look fab! This was so hilarious! I don't know how guys wear skinny jeans at all. The jeans are brilliant on you. They sound too brutal to wear though.